In November 2014, Bellingcat published a report that identified the Buk TELAR (missile launcher) that downed Malaysian Airlines Flight 17 as “Buk 3×2,” originating from Russia’s 53rd Anti-Aircraft Missile Brigade of Kursk. The Buk was called 3×2 due to an obscured middle digit, which was not identifiable at the time of the report’s publication. In a new report, we positively identify the middle digit of this Buk by matching seven characteristic features on Buk 3×2, including a unique dent on a side panel, the white marks on the chassis, and the cable arrangement connecting to the missile erector. The middle digit is a three, thus identifying the number of the Buk that downed MH17 as “332” before the middle digit was obscured. In this new investigation, members of the Bellingcat investigation team collected and analyzed dozens of photographs of Buk TELARs that have been posted online by members of the 53rd Anti-Aircraft Missile Brigade since 2010. The full report, downloadable here, provides a detailed analysis of each of these seven features. This summary will compare a few of the most conclusive features. 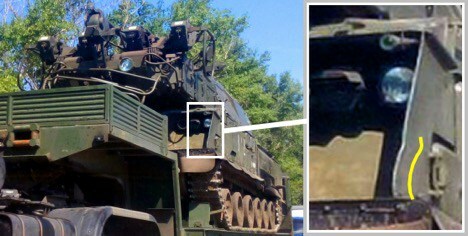 A high-quality photograph of Buk 3×2 taken in Alexeevka, Russia shows an inverted S-shape dent on the left panel. Another identifier for identifying the correct Buk is by studying the cable connections to the missile erector on the revolving turret. There are four cables on both the left and right side leading to the missile erector, providing us with eight cables to compare. After studying a number of Buks, it becomes clear that there are different arrangements and lengths to the cables. 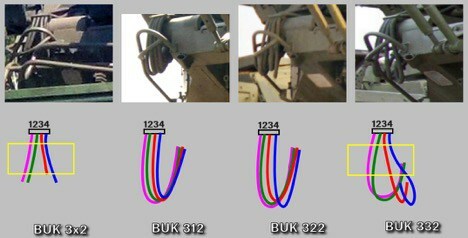 In the following two figures, the cable connections of Buk 3×2 is compared to the ones of Buks 312, 322, and 332. Here, on the right side, only Buk 332 shows a similarity to the cable arrangement of Buk 3×2. The blue-marked cable four is connected to the top plug on the turret chassis. Buk 312 and 322 show a different cabling, and cable four is connected to the bottom plug. Also, Buk 312, 322 and 332 show a distinct shape of the cabling, and only the shape of Buk 332 resembles that of the cabling of 3×2. The comparison on the left side allows only a partial comparison. It is not possible to see the plugs on the turret chassis. 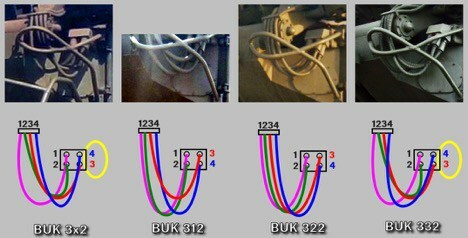 However, Buk 332 shows the same distinct spread of the cabling in the middle that is also visible on 3×2. Nothing comparable is visible on 312 or 322. Taken individually, none of the seven identifying characteristics allows a definite identification. 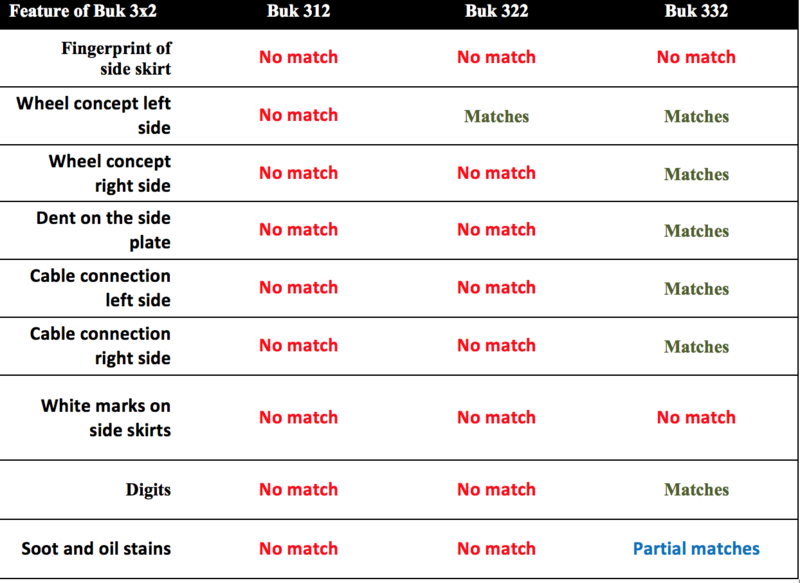 However, taken in sum, it becomes clear that Buk 332 is the only logical match for Buk 3×2. 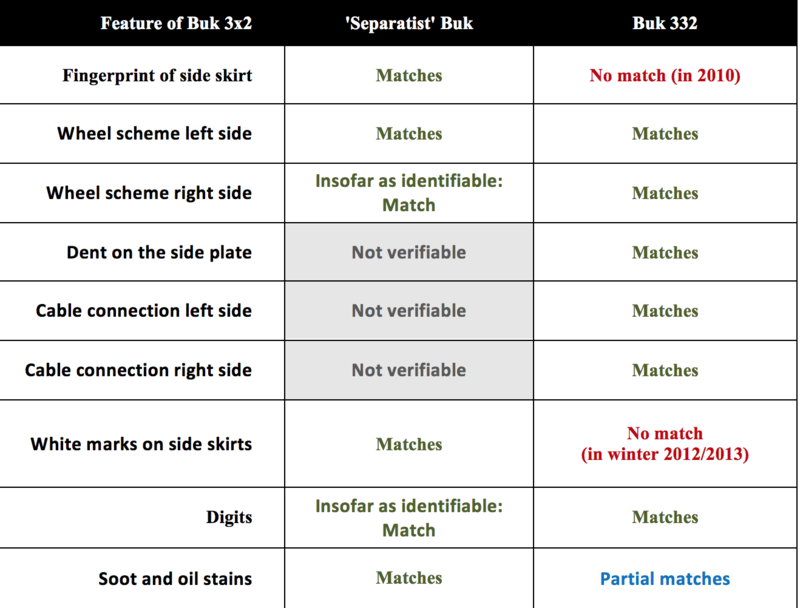 Furthermore, comparing the features of Buk 3×2 in Russia and Buk 332 to the available materials of Buk 3×2 in Ukraine (called the “Separatist” Buk below) reveals that these three Buks are actually one in the same. Many of these features, such as spoke wheels and the H-2200 mark, do not or very rarely appear on Ukrainian Buks. In particular, the Buk TELARs of Ukraine’s 156th Anti-Aircraft Regiment, which was based near Luhansk, Donetsk, and Mariupol in 2014, do not share any visible similarities among the compared characteristics with Buk 3×2, either in Russia or Ukraine. We can say with confidence that on 17 July 2014, the Russian Buk TELAR numbered 332 of the 53rd Anti-Aircraft Missile Brigade based in Kursk was filmed and photographed in eastern Ukraine. This specific Buk, previously identified as Buk 3×2, was filmed moving to the center of the launch area estimated by the Dutch Safety Board for the missile that downed MH17.